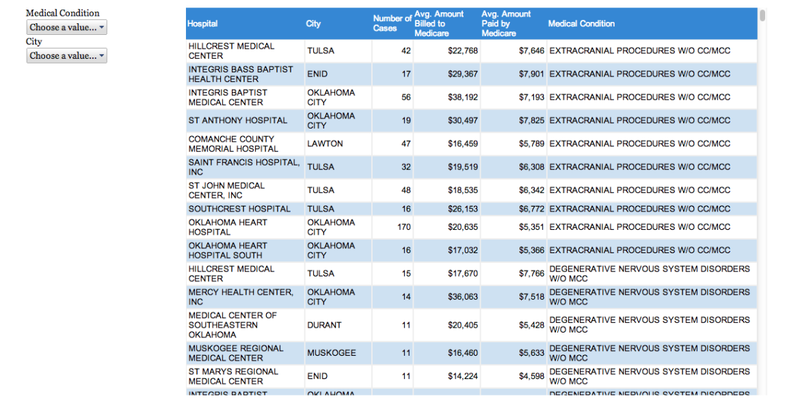 Hospitals in Oklahoma charge very different amounts for the same medical treatment, even within a city or community. Now you can see what those variations are thanks to release of hospital data by the Centers for Medicare & Medicaid Services on what each hospital bills for common in-patient services. The database allows you to select from up to 100 common types of medical conditions, then compare how much each hospital on average billed Medicare, and how much it was paid by Medicare, in 2011. Rick Snyder, a vice president at the Oklahoma Hospital Association, said, “Hospitals use different approaches to setting their charges.” He added that hospitals rarely get from Medicare the full amount charged. One note in the database: In the drop-down menu for medical conditions, “CC” means complications and comorbidities, and “MCC” means major complications and comorbidities. Comorbidities is when two or more diseases exist at the same time.